The supercool tech giant is making a habit of breaking records, but which is the most impressive? If anyone had any doubt who's winning the historic war between Apple and Microsoft, they'd do well to look at the results the two West Coast giants announced yesterday. Perhaps unsurprisingly, the Mac-maker hogged all the glory. While Microsoft's shares plunged 9.25% after its 10.6% fall in profit to $5.9bn (£3.88bn) was announced, Apple revealed a record-breaking set of numbers that set the stockmarkets alight, after hours. Here's MT's breakdown. $74.6bn quarterly revenues. 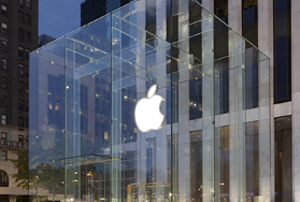 Sales of Apple products during the three months to December 27th surged 29.5% higher than the same period last year. It's an all time high for the firm - in fact a record for any company - and smashed investor expectations. The driving force behind this record revenue rise was, of course, the iPhone 6. The company shifted an astonishing 74.5m iPhones over the period, though it didn't specify which models sold in what amounts. That's 33,740 an hour, or 9.4 a second. Of course, iPhone 6 sales were always going to be high. The release of a new and much anticipated model during the frenzied Christmas quarter guaranteed impressive figures. But demand for the iPhone 6 and 6 Plus have consistently beaten both Apple's and investors' expectations. It has been, as Apple boss Tim Cook put it, 'staggering', with sales up 46% on the same quarter last year. The 6 Plus is widely seen as the runaway success, which has once again shown Apple's knack of anticipating consumer trends. According to a report by Juniper Research, 'phablets' will make up 20% of smartphone sales by 2019. Who would have thought so many people would buy a phone that doesn't fit in your pocket? A possible downside is, however, the effect that this supersized phone may have had on iPad sales. They fell 18% to 21.4m units over the year, though stronger competition in the sector and possible market saturation at that end of the price scale were also important factors alongside Apple's own cannibalisation. The slowdown in its tablet division won't be worrying Apple too much, however. It seems that the firm is finally taking off in the massive growth market that is China. Quarterly sales in the world's second largest economy increased 70% on last year to $16bn, just $1bn shy of the total for Europe. There had been some expectation that China sales would have exceeded those in the US for the first time, but the recovery in America and general enthusiasm for the new iPhone there meant its Chinese sales teams were chasing a moving target. The final result of all these revenues, alongside Apple's impressive 39.9% gross margin, of course, was a quarterly profit greater than any company has ever achieved. Apple earned a cool net $18bn, up 37.4% from the same period last year. Take that ExxonMobil, which had the previous record of $15.9bn in 2012. And what does Apple do with all that profit? It gave some back to investors - $57bn over the last year, in fact - but a lot of it's going on the pile. Apple's mountain of cash and marketable securities is now $178bn, somewhat more than Ukraine's GDP and somewhat less than New Zealand's, according to the International Monetary Fund. What it will do once it has all the world's cash under its mattress is anybody's guess. Despite perhaps wanting a little more in dividends (Carl Icahn anybody? ), investors were unsurprisingly chuffed at these numbers. Shares rose 5.7% in after hours trading to $115.40. That optimism perhaps also reflects a belief that Apple's recent successes are set to continue. The firm projects revenues next quarter of $52bn-$55bn, which would be way above recent years. This doubtless reflects continuing growth in China and Asia-Pacific generally, and the much anticipated launch of the Apple Watch, which is now due to come out in April - one month late. That's not a great start for a watch, admittedly, but then your standard Rolex doesn't have to find out where your nearest Samsung store is to the nearest 15 feet or give directions in Swahili. Given Apple's colossal $1.9bn R&D expenditure for the last quarter, some of which must surely be going into Apple Watch tweaks, we'll forgive them for the delay. It's all looking pretty bright for Apple, then, which is why we also won't begrudge Tim Cook for his recent 40% salary hike to $2m, up to $9.2m including bonuses. Read MT's profile of Apple in the post-Jobs era to get a better idea of the challenges Cook is facing.